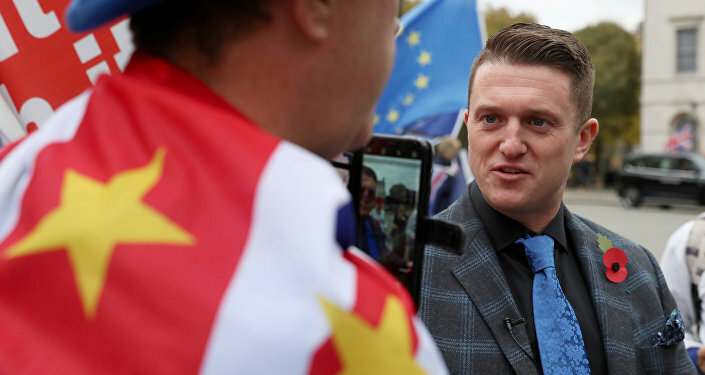 British right-wing activist Tommy Robinson, a vocal critic of Islamisation, has already lashed out at The Sun for spreading the footage without providing proper context. Tommy Robinson, the co-founder of the right-wing street protest movement English Defence League, has proclaimed himself “king of the whole Islam race” in a newly released video. In the footage obtained by The Sun, Robinson is heard singing: “I’m going to punch you in the head, kick you in the face, because I am the king of the whole Islam race”. Robinson also declared himself a Zionist and said that “if there was a war tomorrow, which there will be, because I’ll probably start it at the end of this sesh”, he would fight for Israel. “I had to ring Benjamin Netanf**king blah … I can’t remember his name, and got my Zionist card out and said I am a Zionist and I bought us everything. Shalom motherf**ker”, he added. In another video, Robinson is seen talking to the camera and saying: “No matter where I’ve gone in the world, I score. I will show you tonight. I’ve gone to f**king Qatar, I’ve gone to Doha and scored gear on the sesh while they’re all praying. Everywhere mate, every city I’ve gone to”. After the videos were unearthed, Robinson took to Facebook to say that the footage was from a group chat with friends of different ethnicities, who were “bantering each other non-stop”. He also assumed that one of his friends had sold the video to the UK tabloid, and called them an “absolute snake”. EDL’s former leader was already on a suspended sentence for contempt of court for recording a video in Canterbury Crown Court in May 2017 during the trial of four suspected rapists, which made the judge activate a three-month sentence for the previous offence and add 10 months for the new one. After he was released on bail in November 2018, PayPal banned his account and froze the donations he had received over accusations of him inciting hatred and promoting Islamophobia. The activist, in turn, slammed PayPal’s move as “fascism” and suggested that it was an attempt to silence him and stop him from working, and reporting stories that “media don’t want to cover”. Also in November, Robinson was named as UKIP leader Gerard Batten’s adviser on grooming gangs and prison reform in a move that was met with condemnation since the party forbids current or former members of proscribed organisations, including the EDL, from obtaining membership.